This mural depicts the Steamboat era of Sodus Bay. By the late 19th century, fleets of luxurious passenger steamers plied the waters of the Great Lakes. This shows the Sodus Bay Outer pier light and a ferry steamboat named “Arundell” that came into Sodus Bay as late as the 1930’s. In their day, steaming the Great Lakes was very much like Caribbean cruises are today. Sodus Point was an important port of call for the steamboats. In 1870, the Sodus Bay Outer pier light was constructed at the end of the pier. Due to cost, the United States Lighthouse Service decommissioned the stone Sodus Bay Lighthouse light in 1901 when the wooden, outer pier light was improved by adding 15 feet to the tower height and giving it a visibility range of 14 miles. The steel catwalk was built to provide keepers access to the service beacon. This mural was painted by James Zeger and can be found inside Captain Jack’s Good Time Tavern in Sodus Point. 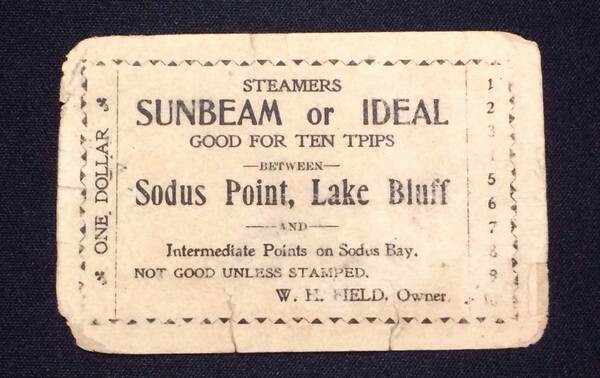 Above is a one dollar ticket good for 10 trips on either the Sunbeam or Ideal steamers which took passengers from the Steamboat pier in Sodus Point (located at the southern end of what is now Willow Park) to Lake Bluff, Resort, Bonnie Castle, Eagle and Newark islands, etc.